In my searches for more minimal style, I ran across Objects Without Meaning, a line of American-made clothing with a refreshing take on fashion. As its interesting name implies, this clothing line views its pieces as blank slates ready to be filled by the people who wear them. The lines are clean and simple, and the entire collection is refined and modern. Most of the items are well above $100, so they definitely fall into the category of investment pieces. But the classic tailoring and style makes each piece worthy of investing, I think. 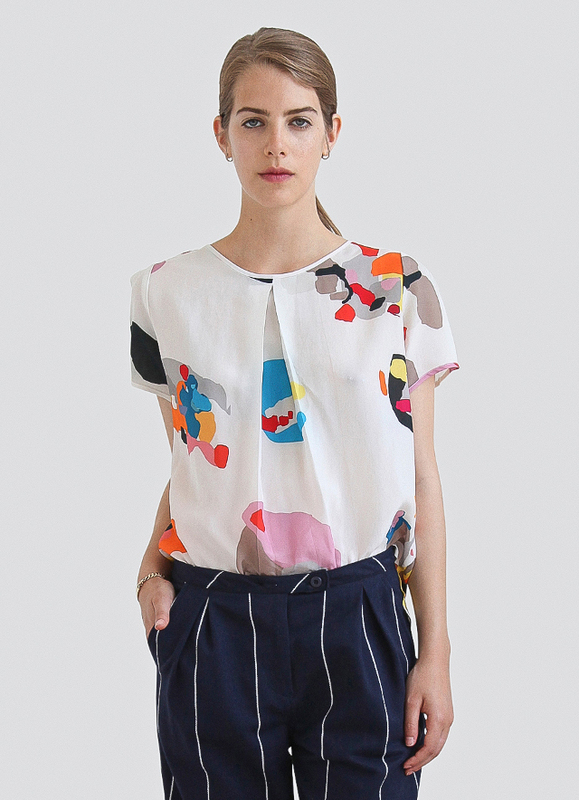 The Francie Woven Tee shown above features the brightest fabric in the collection (the blouse also comes in black), and is a very feminine silhouette. I love it paired with the striped pants, and it would work just as well with a skirt or jeans, too. Objects Without Meaning also uses the pretty fabric in a dress and skirt this season. The Sidney Dress epitomizes the aesthetic of the line, and I love its simple style and shape. This is definitely a classic piece that will work throughout the seasons. I’ve yet to purchase anything from Objects Without Meaning, but their site is a source of inspiration for me. I hope you’ll check it out, too. I love the philosophy behind the name!